To create a smart, next generation wireless network for fast video and content sharing across devices, SMART Wi-Fi Router EA6300 is built with the latest Draft 802.11ac wireless technology for speeds approximately three times faster than Wireless-N so it is ideal for fast HD video and media streaming. 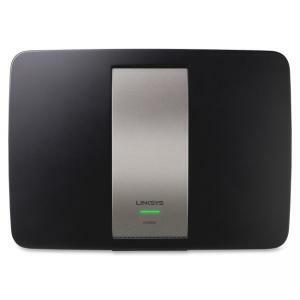 Router with AC wireless technology includes Linksys SMART Wi-Fi to give you visibility into your home network from anywhere at any time for the opportunity to access mobile apps to easily enhance and control your connected life. Easily connect Wi-Fi devices to your home network with a push of a button (WPS). Higher quality antenna technology helps to maintain high speeds across greater distances throughout your home for maximum wireless coverage and in-home mobility. Router is backward-compatible with a/b/g/n devices. IPv6-enabled router also features one USB 3.0 Port to print, share and store content and four Gigabit Ethernet (10/100/1000) ports to connect to wire devices. $6Softalk 48106 Modular Telephone Extension Cable - Ivory - 84"